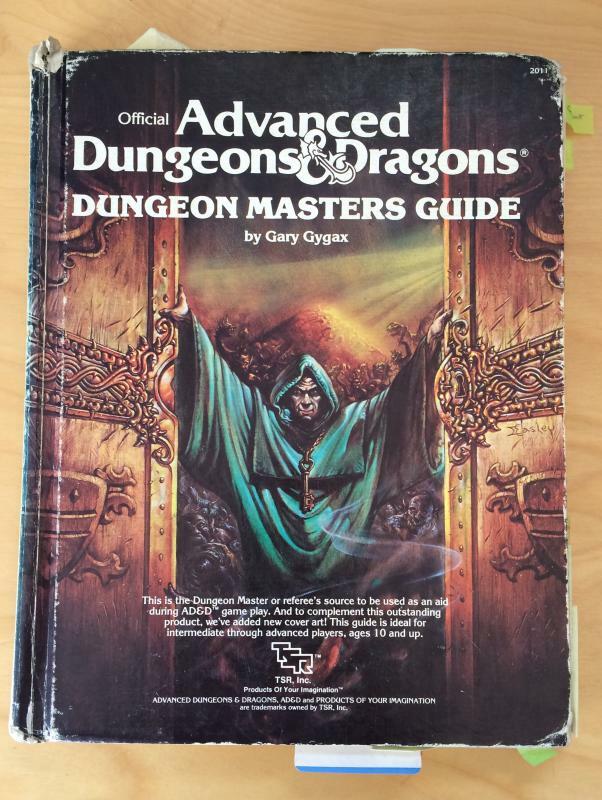 To me, the 1st Edition Advanced Dungeons & Dragons Dungeon Masters Guide by Gary Gygax is perhaps the best gaming book I have ever owned. In fact, I think it’s a strong contender for greatest gaming book of all time. There are many contenders for Best Bit of the 1st Edition AD&D Dungeon Master’s Guide. It may not surprise you in the least to learn I love the dungeon dressing section in Appendix I (Hell, I published a 334 page book based on that section) but—at the end of the day—it’s a relatively well-known section. The table(s) I love, and use in my own Borderland of Adventure and Shattered Star campaigns, are those dealing with Disease and Parasitic Infestation in the “Character Age, Ageing, Disease and Death” section (pages 13 and 14). In brief, the tables deal with the possibility of a PC contracting a disease or parasitic infection and provide an array of such maladies while in a town, city or other such location. I love them (and so do my players…sort of). Why do I love them? Well it’s not because I revel in the death and suffering of the PCs. Rather, I love the nod toward verisimilitude and detail to which the section eludes. It perfectly encapsulates Gary’s approach to the game—to create a world that reeks of realism and detail (as much as any world stuffed full of dragons, elves, orcs and more can anyway). Medieval cities were dirty, dangerous and unhygienic places wracked with disease, malnutrition and more. It stands to reason anyone living there would have a higher than normal chance of contracting some kind of nasty disease or ailment. One downside of the tables is that—in theory—a PC could die of some virulent disease. That’s not particularly heroic and not really what the game is about—unless said disease was contracted from a mummy or suchlike. Luckily, this hasn’t come up yet in my campaign. If it did, I’d like to think I’m a competent enough GM to offer or provide a way out of the situation, which could enhance the campaign. Perhaps a PC’s illness could lead to an interesting sidetrek or sub-plot. It could lead to the introduction of a new re-occuring NPC who helps cure the PC. At the very least—hopefully—it’s going to end up with some interesting roleplaying challenges. So what’s your favourite little known section of the 1st Edition AD&D Dungeon Master’s Guide? Have you used the tables yourself? Let me know in the comments below. The thing I like about the Disease and Infection table is that it injects a bit more resource management into the game. If there’s a chance that any water you drink in the wilderness is tainted, then you’ll have to either lug around some “safe” water (or wine or small beer or mead or what have you), boil the drinking water (which may be one of the more excusable “player knowledge vs character knowledge” situations) which ought to reduce your overall land speed, or prepare spells such as Purify Water (or their equivalents in other editions). It might encourage PCs to prepare Cure Disease and Heal spells (or create potions, scrolls, or wands of such spells) as well. Anything that makes the choices the PCs make more meaningful is a good thing in my book. I hand’t considered the resource management aspect of this table. Thanks for bringing it up. In my campaign, back in the day, people thought disease was caused by invisible demons. They knew if you boiled water, that drove the demons away. They also knew the demons hated certain herbs, so they applied them to wounds to keep the demons out. Peasant midwives knew the secrets of keeping the demons away from mother and baby. Of course, upper-class people knew there were no such things as invisible demons; any educated person could tell you that disease was caused by an imbalance of the humors. Why were peasant babies so healthy and noble babies so often sickly? Obviously, the animal vigor of the lower classes! There was also a common plant that could be brewed into a contraceptive tea. Peasant women drank “ladies’ tea” every day unless they actually wanted to become pregnant — and, since their children weren’t dying like flies, that wasn’t “constantly.” Between that and the competent midwives who knew how to chase away the invisible demons, there were very few peasant women who died in childbirth. So, with those two things — the “invisible demons” that amounted to the germ theory of disease, and the “ladies’ tea” that provided safe, effective contraception — which were scoffed at by the upper classes, I set up a world in which our typical fantasy RPG tropes actually sort of worked. There was a reason for adventurers to exist in the first place, there was a reason and a means for female adventurers to exist, there was a reason for frail princesses to be in need of rescuing, and there was a reason every last one of those adventurers didn’t die of the creeping blorch in his first week away from home. Or before he left home. This is brilliant! I love the flavour. Yup. That’s an epic table! My favorite is the Potiom Miscibility table – I am guilty sometimes of literally feeling like I can’t wait to use it! This is based on memory only, but I recall some very fun times making castles with the castle-building rules. And the artifact creation tables! Those were fun too. I dug up my copy (looks less battered than yours) in order to quickly find a fun table. I had forgotten how densely packed this book is with cool tables and other fun stuff. I’ll spend some time reading the whole book again, so thanks for bringing this up! For example : there is a whole section on boats, including a table on how long it takes for various types of boats to burn down due to an uncontrolled fire. That sounds like a very cool section. I’m going to have to find that for my own campaign. Several of the players are paranoid about anything adventure involving boats. I fell now duty bound to point out that section to them! I seem to remember the grappling rules in the first DM’s guide meant that giant’s were far more lethal grappling you than using weapons. 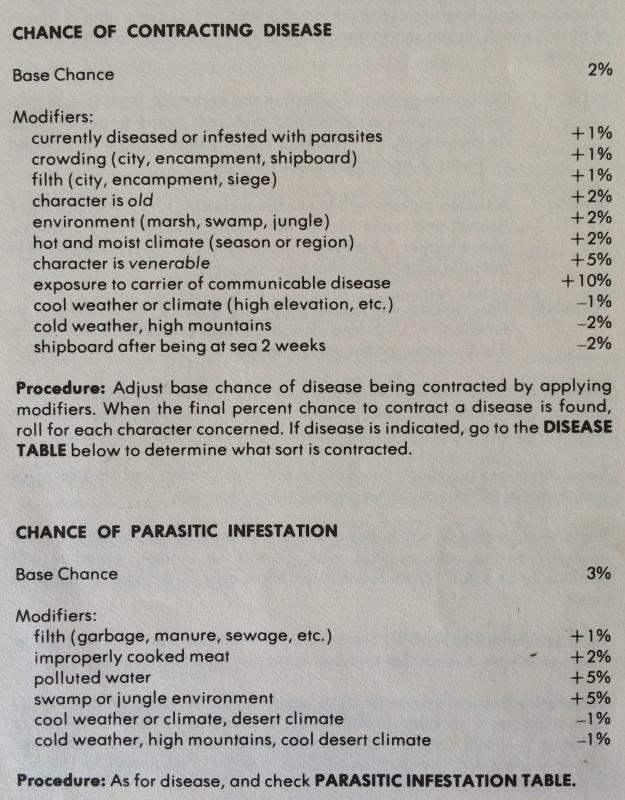 A little research on real-world parasites would make the parasitic infection table an interesting new way to generate adventures. Maybe the PC is infected by a human-attacking version of the tongue-replacing isopod Cymothoa? What if it begins to whisper secrets from the PCs mouth, perhaps hinting at great treasures somewhere. Do they follow up on these whisperings? Do they remove the parasite before it eats the PCs tongue completely? Or leave it in the hopes of getting more info, and replacing the tongue later with a spell? Or how about parasitic worms lodged in the lungs that grant strange abilities like water breathing, or even acid spitting, but at the cost of an increasingly weakened condition. There’s a lot of cool stuff you could do with this table and a little research on all the bizarre things real world parasites do. These are very cool ideas. I love them. Curse you, for putting them in my head! My favorites are a few I was just stealing…. uh…. “reworking” for my current campaign…. 5ed deals with these subjects in the broad view. By using these three, it gives the characters a better visual of what happens, rather than just “you grapple him successfully”. I really enjoy gritty settings steeped in realism, and suspense. Great post!